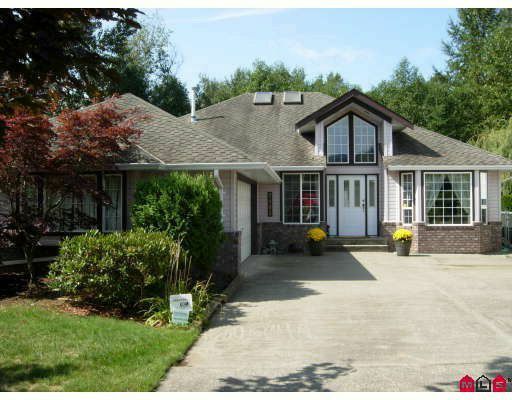 Take a look at this elegantly updated rancher w/bsmt in one of Mission's finest subdiv. The vaulted ceilings, open plan & warm designer colours. Fully renovated kitchen with lots of counters, gas cooktop & stainless venting is great forentertaining or step into the separate formal dining room. Three full bedrooms up, the master complete with a huge ensuite and WI closet. Many options for the huge basement area, presently a media room & 1 lge bedroom with lots of unfinished area waiting for your ideas. Great for the inlaws or teenagers. Backing onto Greenbelt, in a quiet cul-de-sac and only steps to all levels of schools and transit. A pleasure to show, quick possession avail.